[WARNING] eyes may explode due to holo-ness! The picture above and below are taken in direct sunlight. Wow! Check out my instavideo here. This is two easy coats pluc top coat. And below is how it looks in natural daylight. So pretty! Tell me, what do you think? :* Thanks for stopping by! Have a great weekend! 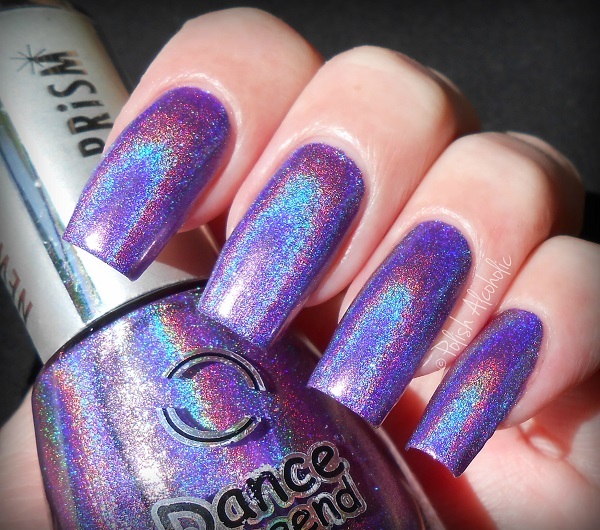 This entry was posted in Dance Legend and tagged blog, dance legend, dance legend cosmic rainbow, dance legend new prism, holo, holographic, hypnotic polish, nagellak blog, nail polish, polish, polish alcoholic, review, swatches by Polish Alcoholic. Bookmark the permalink. Eyes explodes. Cannot see. Too pretty! Super gorgeous!!! Thanks for the warning. I put on my special holotastic specs!!! 🙂 This is definitely one of my favorite holo polishes! My eyes just exploded! Haha. Crazy in love with this color! It looks amazing on you.